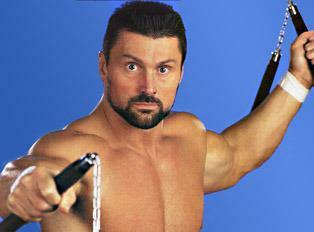 Headlies: WWE Remembers November 9, 1997 as "Steve Blackman Debut Day" - WrestleCrap - The Very Worst of Pro Wrestling! STAMFORD – Looking to commemorate a landmark day in World Wrestling Entertainment history, WWE officials have declared November 9 “Steve Blackman Debut Day”, recognizing his pay-per-debut at the 1997 Survivor Series. Blackman, 52, was unable to attend the festivities and unable to comment on the honor, but a WWE representative spoke on the matter, citing Blackman’s five minutes of involvement in the Team Vader/Team Bulldog elimination bout, before his hasty elimination via countout. 11 Responses to "Headlies: WWE Remembers November 9, 1997 as “Steve Blackman Debut Day”"
In honor of this momentous occasion 15 drunken marks will attempt to set The Guinnes Book of World Records for run ins during the Raw main event. 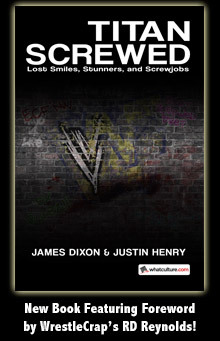 They will be wearing tee shirts saying Blackman Lives Matter and will try to get placed into the Survivor Series WWE World Heavyweight Title Tournament. The mob will be appeased when it is announed that the reunited Head Cheese will recieve a twg team title match opportunity at the ppv instead. Blackman Lives Matter. That should be a t-shirt. Blackman was cool. He gave the impression that he could kill you. That’s cause he really could, if he wanted to that is. Seeing this article with the gif next to it of Dixie geeking out goes beyond absurd. I’m surprised Dixie never hired the black man. She probably did try. Only for Steve to kill a dog with a sneeze and reply no. He was pretty awesome, I’d take Blackman/Snow over the Usos or Matadors anyday. Definitely the most memorable event to occur at the 1997 Survivor Series! Hmmmm…why does 1997 seems so familar….oh well, I’m sure Vince will bring up again on Raw soon and remind me.